I thought I’d write a little progress update on the SAAHE conference, just in case you’re considering registering but hadn’t made up your mind. If you’ve been following on the mailing list, then there’s probably nothing new here for you. The SAAHE conference is perhaps the largest annual gathering of health professions educators on the continent, represented by academics, researchers and clinicians from many of the higher education institutions in the country. It’s a wonderful opportunity to share insights, research findings and experiences with colleagues who are passionate about teaching and learning in the context of health care. We’re really excited to announce that our mobile app is coming along nicely. This is the first year that we’re actively promoting the use of mobile devices for our delegates to keep up-to-date with the conference proceedings. The app runs on all mobile devices, as well desktop and laptop machines, so no-one is left out. It’s not quite ready to be published yet, but here’s a sneak peak. Mobile conference app running on an iPad. We’re also really pleased that, for the first time in SAAHE’s history, we are having a South African keynote speaker along with our international speakers. Steve Reid joins Debbie Murdoch-Eaton and Jason Frank, along with the winner of the SAAHE Distinguished Educator award (still be announced), in the lineup of keynote presenters. This year the conference will be held off campus at the DoubleTree Hotel, due to planned renovations that would make hosting on site logistically complicated. The hotel is a great venue, conveniently located near the city and also able to provide accommodation to out of town delegates. Entrance lobby at the DoubleTree Hotel. If you are interested in attending the SAAHE conference, please visit our information page, or contact the conference manager, Debbie Rorich, for additional details. 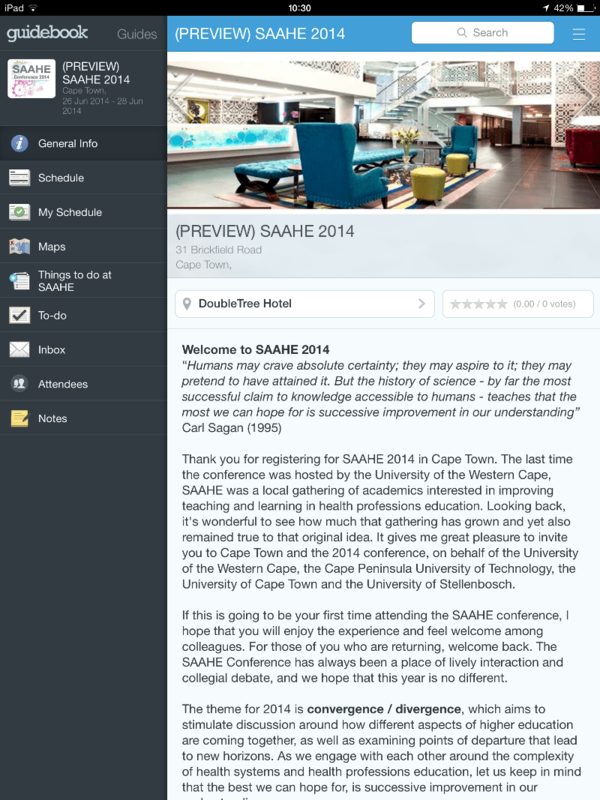 We look forward to seeing you at the 2014 SAAHE conference in Cape Town.